We can't wait for World Cup 2010! It is our greatest wish - goal if you will - to have all 32 teams' official jerseys. We're thus quite proud to bring you the official home jersey of one of this competition's Cinderella teams. Denmark 10/11 Home Soccer Jersey. The new shirt design pays tribute to past football heroes and great achievements, and is inspired from the flag of Denmark, the Dannebrog. 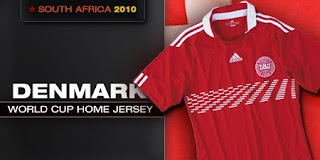 The 11 dotted lines across the chest are a tribute to the collective of the national team and 11 players who are on the pitch for the Danish Dynamite. The shirt is made with adidas ClimaCool® - advanced material engineered to reduce heat and moisture build-up, allowing increased comfort and performance – to keep you feeling fresh no matter how long you play, train and cheer on your favorite World Cup 2010 soccer team!